We have a wide range of high quality sands to cover a vast spectrum of uses. 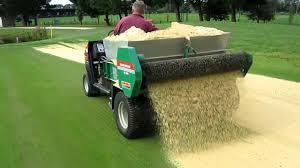 Bunker Sand: Free draining moist silica sand specially formulated to perform in golf course bunkers. Available in bulk tipper loads. Rootzone Sand and Top Dressing Sand: Supplied to meet specific requirements in the construction and maintenance of natural grass playing surfaces. Available moist or dry in bulk gags & bulk tipper loads. Kiln Dried Sands: Primarily used in the infill of synthetic grass surfaces we can supply a wide selection of the required grades across the UK – available in 25Kg bags, Bulk bags and bulk tipper loads. Playsand: We have a range of moist sands that confirm to BSEN1177 from various sites around the UK. Available in bulk bags or bulk tipper loads.